So every February about this time our staff ladies pull out every sponge, broom, mop, and even toothbrush to get our cabins back to our 4 diamond standard. The ranch closes after Thanksgiving and our opening day this year is Feb 17th. I am not able to participate like I use to (each baby I have makes that a little bit more difficult) but I am confident to say that it is one of the hardest jobs and rewarding jobs all at the same time. 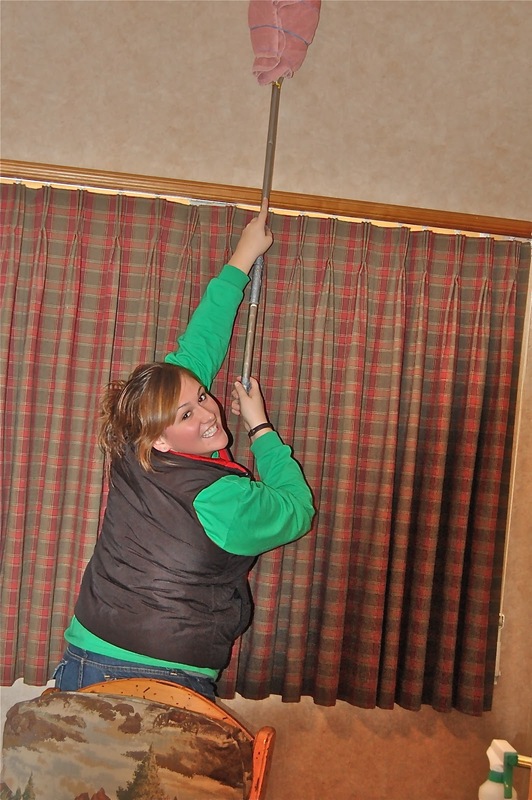 The motto of spring cleaning is "NOTHING in our cabins goes untouched" and so everything from behind the couch to every square inch of the ceiling, our faithful cabin girls clean it. These girls are truly my heroes on the ranch! Our cabin girls are the "invisible busy bees". One of my favorite parts of staying in a hotel is the fact that I am not responsible for cleaning it. These are the girls that actually make that possible here at the ranch. They make sure that every bed is made perfectly, every toilet is clean, and are always looking for any way to make our guests feel more at home. I am always reminding our cabin girls that they are learning life skills...they are learning to be servants, learning the meaning of hard work, and are learning to do it without much glory. They are the girls that my little girl is all ready emulating and I love that she does. I thought you might want to see what goes into getting our cabins up and running and meet our cute staff ladies that make this happen. Thank you girls for working so hard, but most of all thank you for having such a good time doing it! You are my heroes! Oooooaaaaah, you darling cabin girls! Way to go! Keep up the good work! Not only are you learning life lessons, but you are making lifelong friends. I am sure Carter will be thrilled to see CK's smiling face on here once he's feeling a little bit better. Oh, Brooke! My heart so aches to be there with you all. I pray that this time of community bonding is heavily blessed and I am so excited to come and visit that community in a few weeks. Oooo-aaaah and I miss and love you all so much!! My first and some of my fondest memories from the Ranch come from Spring Cleaning. That was when some of my best friendships started! 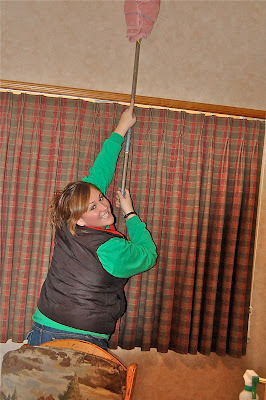 Cleaning those walls in the Cliff Dwellers...oh man! Good times! How awesome of you to give them such recognition. It seems in this world the people who work hard behind the scenes never gets noticed!